Portable Wallpaper Generator For Your Desktop ! 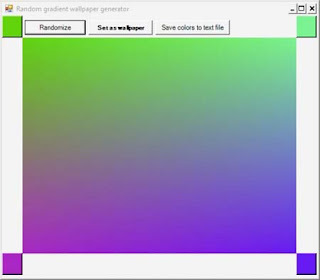 Wallpaper Generator is portable software program that has the ability to create gradients and that can be used as the wallpaper for your local computer. In this software, there are only a few options available for making your work easier. Colors will be displayed on each corner of the interface that has the ability to determine how the gradients will look like. If you click on a color, you can get the Windows Color Picker and the changes whatever you make will take immediately effect. Once you choose all four of the gradients, you can set it as the wallpaper.